One of the four principal rivers of Palestine (Yer. Kil. ix. 5; Yer. Ket. xii. 3; B. B. 74b). Owing to its small tributaries, its water is turbid and consequently unfit for sacrificial use (Parah viii. 10; comp. Tos. to B. B. 74b). 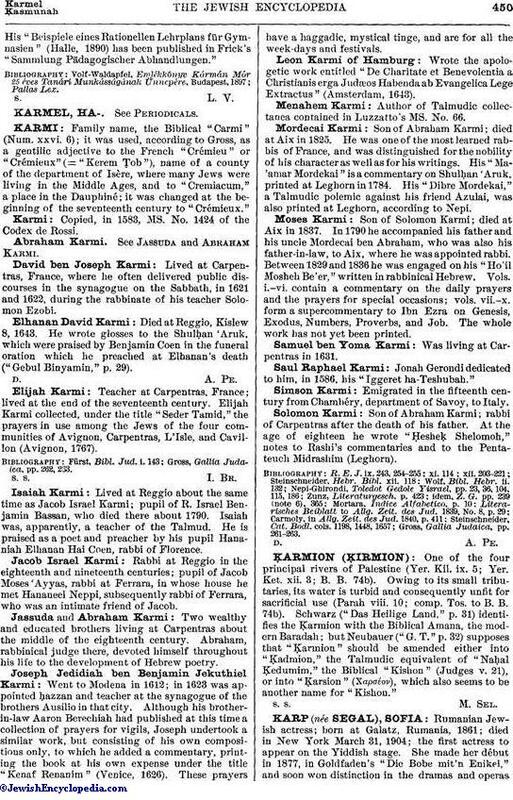 Schwarz ("Das Heilige Land," p. 31) identifies the Karmion with the Biblical Amana, the modern Baradah; but Neubauer ("G. T." p. 32) supposes that "Ḳarmion" should be amended either into "Ḳadmion," the Talmudic equivalent of "Naḥal Ḳedumim," the Biblical "Kishon" (Judges v. 21), or into "Ḳarsion (Xαρσέον), which also seems to be another name for "Kishon."